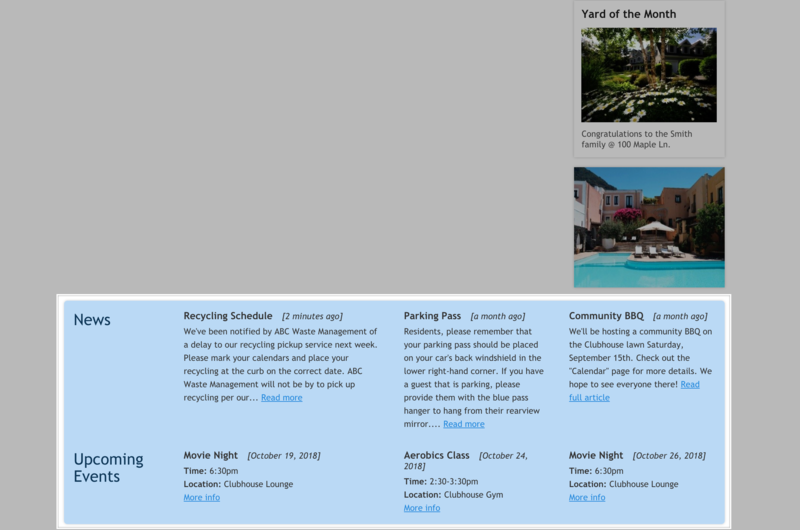 Overview of how to add news and events to your homepage. The homepage offers settings you can enable to showcase recently published news articles and upcoming events. This information will be pulled from the "Calendar" page(s) and "News Articles" page(s) you've added to your website. The items it retrieves from those pages will take into consideration any page restrictions you've set, so visitors never see information they don't have access to. When these settings are enabled, the homepage will list the first three upcoming events and the three most recently published news articles added across all "Calendar" and "News Articles" pages the member can view. Visit your homepage and click on the "Modify settings" tab in the light blue admin box. Select the options "Show recent news articles," and "Show upcoming events." Now, the news articles and calendar events will be displayed at the bottom of the homepage in a highlighted box.